Gov. 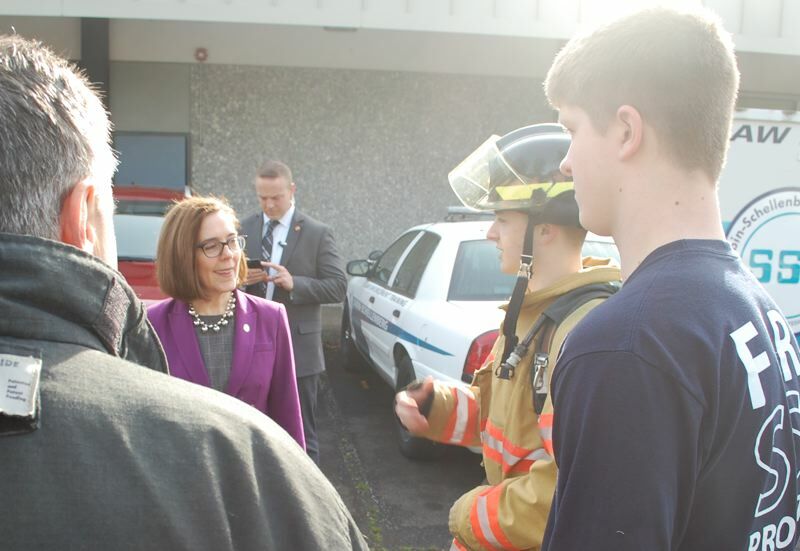 Kate Brown visited North Clackamas' Sabin-Schellenberg Professional Technical Center on April 9 in an effort to boost the future of career-oriented educational programs throughout Oregon. 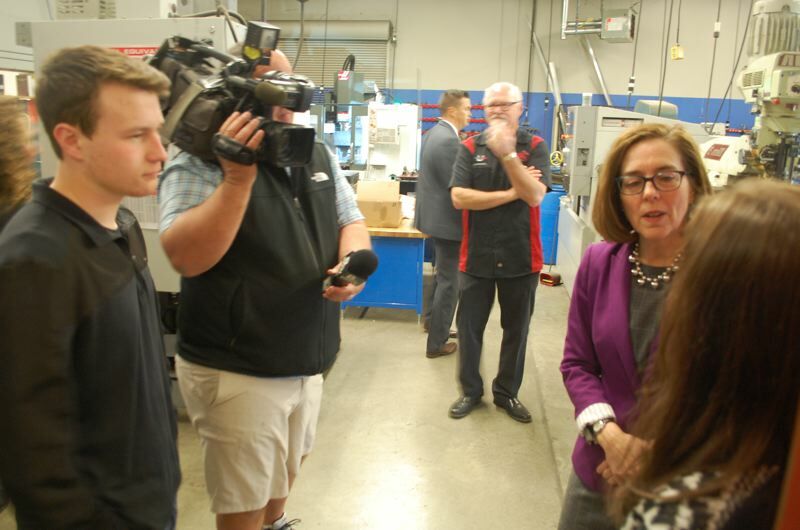 Brown said that career and technical education will be "absolutely essential" for targeting Oregon's "abysmally low graduation rate." NCSD's four-year graduation rate went up to 84.05 percent last year, compared to 76.7 percent statewide average for students who were supposed to graduate in four years by 2017. 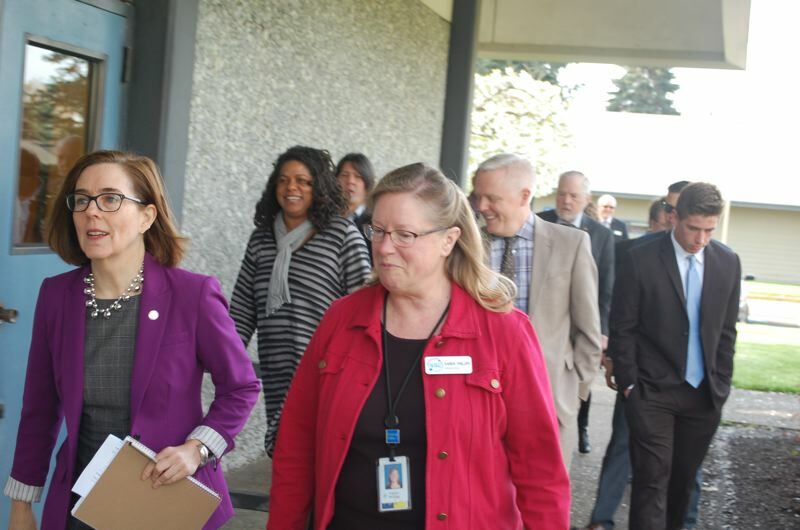 "Clackamas is leading the way," Brown said on the tour with North Clackamas School District officials, a state representative and the local state senator. Rep. Mark Meek (D-Gladstone) said he has told Brown that he is "ready for the budget fight" in the next session of the Oregon Legislature. Meek wants to create more funding for education in general so that a proposed mandate that school districts set aside funding for career and technical education won't take funding from other programs. Prior to her Sabin visit, Brown visited Bilquist Elementary to learn about "Ready, Set, Go," a free program designed to help 3-5 year olds and their parents/guardians — whether their first language is English or Spanish — successfully prepare for kindergarten in partnership with Metropolitan Family Service, the North Clackamas Education Foundation and the Clackamas Early Learning Hub. While on the 45-minute tour of Sabin on Monday morning, Brown focused on talking with students, including manufacturing/engineering teacher David Mitchell's students Jennifer Nordgren and Morgan Montre. Mitchell said that his students graduate from the program as certified welders and can easily get jobs right out of high school. Brown noted, with Oregon's currently low unemployment rate, many employers have been telling her that they are having trouble finding qualified employees who are willing to work eight-hour days. Taking the class "has helped me get skills that most people haven't gotten," said Montre, a senior at Clackamas High School. Meeting with the students training as firefighters, Brown predicted that the state will probably need "more and more" of them to fight wildfires. Retired firefighter Neal Dietz said he came back from retirement to teach the class. His students Noah Stevens and Benjamin White were honored to have met the governor. "It shows that she can take her time to see what we're all about," White said. Brown surprised broadcasting student Jake Bushman by asking him for a question to ask of herself. Later asked how he would formulate a question now that he's had some time to think about it, he said he would ask Brown: "Will public education be better next year than it was in 2018?" 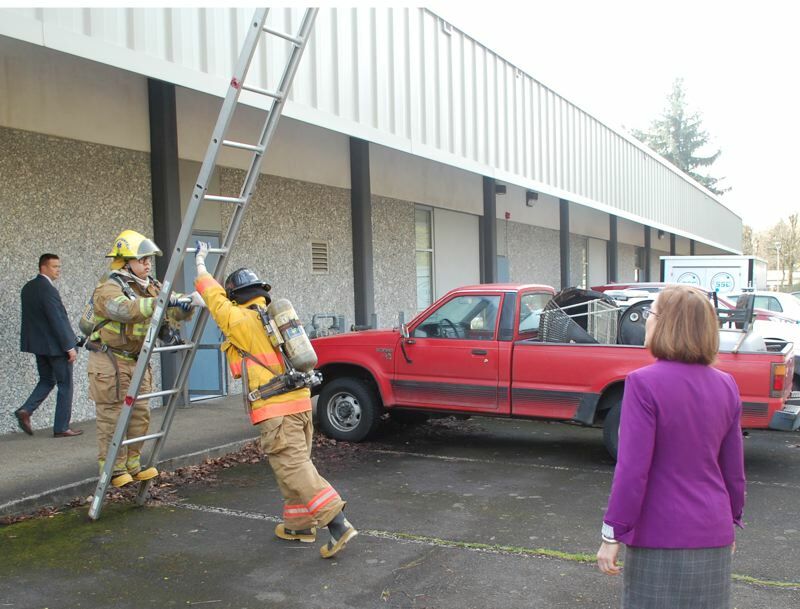 Sabin-Schellenberg Principal Karen Phillips said over 98 percent of North Clackamas students take classes at the career and technical center by the time they graduate, with buses from the home high schools preventing barriers to access. Her students earned 2,856 college credits in 2016-17 throughout the 18 programs at Sabin-Shellenberg. Even students with small amounts of hands-on career-technical programs, such as woodshop and mechanics, seem to succeed. An average Oregon student with just half a credit of such a program graduates at a rate of 86.3 percent; those who concentrate on career and technical education, with a full credit or more, graduated at a 91.7 percent rate. Brown was criticized last year for not fully funding the requirement of Measure 98, which voters passed in 2016 to create an earmark for high school graduation boosters, like career/technical education. The budget passed by the legislature only funded half of the cost, according to Measure 98 proponents Stand for Children.